Why does my fireplace smell especially during humid or rainy seasons – mainly in spring/early summer?? Answer: The basic answer is that your wood burning fireplace chimney is filled with smelly creosote deposits that have accumulated over the burning season. 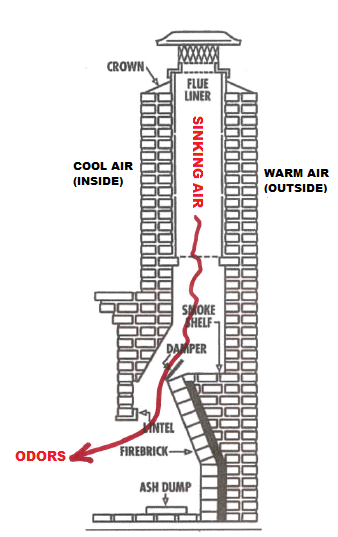 During spring and early summer, the airflow in the chimney can reverse and the downward movement of air flow into your living area through your fireplace opening can bring smelly odors with it (see sketch below). There are many reasons for this airflow reversal but the most common is that when your air-conditioner cools the inside of your house, it can also cool the inside surface of your exposed chimney to the living space. By cooling your chimney area, the cool air will sink because it is cooler than the outside air and cause the downward air movement. During colder seasons, the air inside your chimney is normally warmer than the outside air and hence the chimney airflow is upward. Certainly the first primary solution is to have your chimney cleaned as soon as possible. This process will remove a good deal of the dangerous combustible creosote that is in your chimney flue. Typically, your chimney should be inspected and/or cleaned once a year anyway so this is as good a time as any. It also beats the fall rush when all chimney sweeps are extremely busy. Once the chimney is cleaned, there is certainly a possibility that some smell/odor will continue. This is due to the fact that even though the chimney sweeping process removes most of the creosote, it generally does not remove all the creosote. Even a small residual amount of creosote can cause the odor problem to continue. To solve any remaining odor problems, here are some possible solutions. These solutions are for wood burning fireplaces-not gas fireplaces. Tape a 2 foot long piece of toilet tissue in front of your fireplace opening and open the damper slightly. If the toilet tissue is pulled into the fireplace opening slightly, you now have a positive draft with an upward flow and you have solved the problem. Simply keep the damper slightly open for the remainder of the summer. With the toilet tissue in place, and the damper slightly open, experiment by turning off some nonessential items in your house that could cause a negative pressure. Examples are: bathroom fan, kitchen stove exhaust fan, clothes dryer, attic exhaust fan, etc. In combination with Item 1 above, slightly open a window – with screens in place – in the room of the fireplace to equalize the negative pressure in the house. With airtight houses today, a negative inside air pressure can be equalized by opening a window. If the above items fail, close the damper completely, and stuff a piece of unfaced fiberglass insulation across the entire area of the damper. Even though a damper is closed, there is always a small air leak around the perimeter of the damper which the fiberglass insulation will seal. Caution: don't forget to remove the insulation prior to your next fire! Place a large note on the fireplace grate as a reminder. In extreme odor cases, where the above items are too bothersome and/or the odor is too extreme, a special designed fan can be placed at the top of your chimney and turned on a very slow speed to guarantee an upward movement of air flow. This solution is certainly more expensive than the above items, but it is a guaranteed solution! Bill Hussel, owner of Hansen And Sons (in Madison, Wisconsin) would be happy to answer any other questions about fireplace odor problems. You can reach him on his personal cell at 414-429-6164. Otherwise, call the office for a chimney cleaning/inspection appointment. The office number is 608-244-9466.